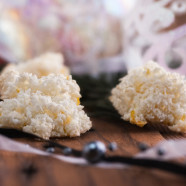 These lemon zest macaroons are easy to prepare and always appreciated during the Christmas season. 4 egg whites Beat egg whites till firm peaks form. 1 tbs vanilla flavoured sugar Gently blend in icing sugar and vanilla flavoured sugar. Zest from one fresh lemon Add the grated coconut and the lemon zest and mix well. Set aside in refrigerator for 1 hour. 30 g ( 2 tbs ) soft butter to grease parchment paper Cover baking sheets with buttered parchment paper. With moistened fingers, shape dough into little balls, the size of a walnut and place on buttered parchment, about 3 cm (1 inch) apart. Oven temperature: 150 °C – 300 °F / 12 minutes Bake for about 12 minutes, till edges become golden. Do not over-bake – macaroons should be soft and chewy inside, yet crispy / crunchy on the outside. Set aside on rack to cool. These macaroons may be kept in cellophane bags or in a tin box. Thank you for your comment, Jeana! we are happy to try out new ideas and experiences of others.